President Trump has now moved on from steel tariffs (with exemptions for some allies) to the real battle: stopping China from gaining market share in America’s key industries: technology, pharma and other knowledge-based sectors. Can China make further inroads globally or will Trump’s policies stop them? The first thing to note is where things are right now. Economists at Goldman Sachs, the US investment bank, have looked at the data. They find that “the US position as a global technological leader remains strong. The US’s economy-wide productivity remains high compared to other advanced economies, and its shares of global R&D, patents and IP royalties remain impressive.” China has been catching up though, but in medium value-added goods sectors and hardly at all in knowledge-based tech. So, while overall, the US share of global high-tech goods exports has declined as China’s share has grown, the US trade sector deficits have been concentrated in medium-high-tech goods rather than in the most advanced categories. Indeed, the US share of global knowledge-intensive service exports has held up, contributing to a rising trade surplus and higher employment in those sectors. Take overall productivity, as measured by output per hour worked. On this broad measure of the productivity of labour, the US remains ahead, even compared to other advanced economies in Europe and Japan. 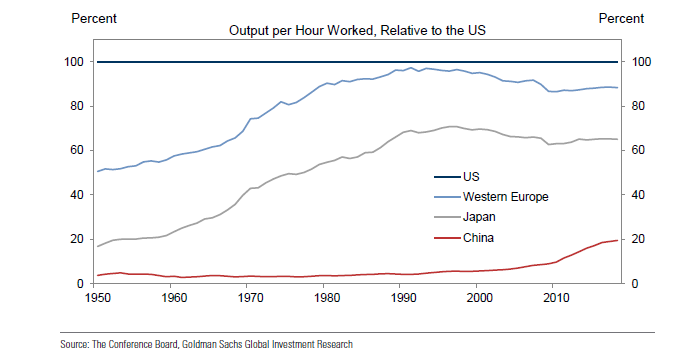 China’s labour productivity level is just 20% of the US, although that is a quadrupling since 2000. 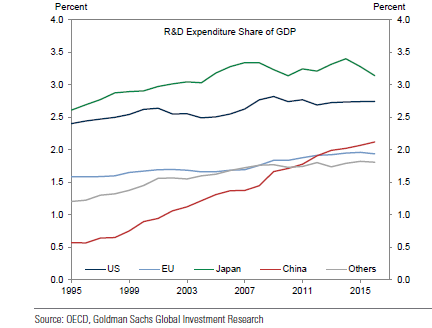 The US continues to invest a relatively large share of its GDP in research and development. While the US share of global R&D has declined, in part due to a rapid increase in China’s share, the US remains the global R&D leader, accounting for nearly 30% of the world total, about 1.5-2 times the US share of world GDP. Total patents granted for new inventions show that the US share has held roughly steady at around 20%. China’s share of total patents granted has risen very rapidly over the last decade to over 20%, but most patents granted to Chinese innovators have come from its own domestic patent office, with far fewer granted abroad. The US share of the world total of royalties on intellectual property has declined somewhat as the EU’s has grown, but it remains very large. China’s share remains negligible. That means US capital is still taking the lion’s share of global profits in technology. The modern 21st century US economy relies increasingly on advanced knowledge and technology sectors for its growth. The share of US GDP for these sectors is now 38%, the highest of any major economy. But China is not far behind with 35% of its GDP in these sectors, amazingly high for a ‘developing’ economy. Where Trump is now concentrating his ire on China is on the share of hi-tech goods sales in world markets. While the US is the largest producer of high-tech goods, its share of world exports has shrunk considerably while China’s share has grown. This rising Chinese competition has caused US manufacturing firms to reduce their patent production, which has been accompanied by reduced global sales, profits, and employment. But on the services side, the US is the largest global producer of commercial knowledge-intensive services and second only to the EU in exports. China’s share remains quite small. If China gains market share in this area, it will really hurt US capital. That’s because, although the US runs a deficit on trade in tech and knowledge industries, that deficit has shrunk from the early 2000s. The US is more than holding its own in this area even since China joined the World Trade Organisation. Indeed, it runs a surplus in knowledge-intensive services, which has grown over the last decade. It is this that Trump seeks to protect. While jobs have been lost to technology replacing labour (capital-bias) and the shift of US industry to China in manufacturing, the employment share of hi-tech and knowledge sectors has risen to about one-third of all US jobs. Trump claims to be restoring the ‘smoke-stack’ sectors where he won some votes, but in reality that battle for jobs is already lost, thanks to US industry shifting out. The real battle is now over profits and jobs in the knowledge-based sectors where the US still rules. But these sectors are highly concentrated in just a few firms, the technology leaders. There are wide swathes of American industry, including tech, which benefits little from this US superiority. Just five firms have over 60% of sales in biotechnology, pharma, software, internet and comms equipment. The top five in each sector are taking the lion’s share of profits too. Contrary to the Ricardian theory of comparative advantage, international trade is transacted by companies not countries and, as such, value (profit) gets transferred to those with technological advantage and they gain at the expense of others. Trade represents a form of combined development, but capitalism delivers this unevenly. As I argued in a previous post, over the last 30 years or so, the world capitalist economies had moved closer to ‘free trade’ with sharp reductions in tariffs, quotas and other restrictions – and many international trade deals. But since the Great Recession and in the current Long Depression, globalisation has paused or even stopped. 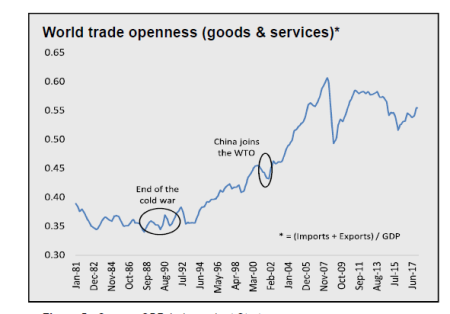 World trade ‘openness’ (the share of world trade in global GDP) has been declining since the end of the Great Recession. It is this decline in globalisation as world economic growth stays low and the profitability of capital remains squeezed that lies behind this new trade war. Trump’s blundering blows on trade have an objective reason: to preserve US profits and capital in the key growing tech sectors of the world economy from the rising force of Chinese industry. So far, the US is still holding a strong lead in hi-tech and intellectual property sectors, while China’s growth has been mainly in taking market share at home from American companies, not yet globally. But China is gaining. This entry was posted on April 4, 2018 at 12:15 pm and is filed under capitalism, economics, Profitability. You can follow any responses to this entry through the RSS 2.0 feed. You can leave a response, or trackback from your own site. “Indeed, the US share of global knowledge-intensive service exports has held up, contributing to a rising trade surplus and higher employment in those sectors. This is largely due to the industrial-military complex. 2) because of the nature of its use value, it has, in a context of national competition (competition between warring Nation-States), infinite demand (arms race). In other words, because it has infinite demand, it can rise its organic composition of capital to levels higher than other sectors. Good article. The US does hold a technological lead. But the window is closing. A point worth making is that the Chinese state is co-ordinating and funding a centralised effort to close the gap, while the US is not. If anything, US government funding has been cut as part of the neo-liberal small state dogma. Trump’s concentration on sanctions is a show of weakness not strength. It is this closing window that makes this period so dangerous. Time is not on the side of the US. I would not read too much into the dominance of much of the US consumer Hi-Tech. As I predicted the FANG have gone BANG and Apple has lost its way. “technology, pharma and other knowledge-based sectors … the employment share of hi-tech and knowledge sectors has risen to about one-third of all US jobs.” Knowledge sectors is left vague here. Stretched to a third of all employment, it must include plenty of routine jobs that employers fill at low to medium pay. Don’t mix up Google’s elite software engineers with administrative assistants at law firms. More broadly, the notion capitalism not China is the problem for U.S. workers is a poisonous combination of true and false. A socialist United States will rebuild its manufacturing, ending most imports from China in the process. Just as a socialist China would end most exports to the U.S. and Europe, concentrating on domestic needs for the Chinese people. See Trade, Trump and Us. Charles Andrews’ piece is either bulbous tongue in cheeky cheek or just plain dumb. Trump’s recycling of American workers within America quip is, of course, his usual bs and a riff on how stupid American workers (and everybody else) are compared to his cynically clever, media-produced, presidential self. “Google’s elite software engineers”? Close to 90% of Google’s revenue comes from online ads via the search engine, Youtube, and DoubleClick. Youtube and DoubleClick were acquired not developed by the “elite” engineers at Google. Google has developed cloud computing software, office suite, Glasses, cell phones, tablets, solar power, …. the list goes on but all of which bring in about a little more than 10% of the revenue and hardly any profits if at all. Your description is accurate. Nonetheless, Google has a cadre of highly paid software engineers. Just ask the people of San Francisco, who are sick of Google company buses ferrying them between their high-end digs in the city and the Google campus. And many people who work in San Francisco are in the so-called knowledge sectors — and are among those angry at the Google privileges. So “my country first” is a socialist policy – “concentrating on domestic needs”? My congratulation, you won Trump for Socialism! Unfortunately Charles A is far from unusual in this respect. His link is worth reading carefully to get understand where most of what passes for the “left” in the US is headed. Democrats and liberals have ALWAYS been more inclined towards protectionism than Republicans, especially the “labor movement”. Pseudoleft’s natural inclination is to posture as more militantly anti-capitalist by attacking “global elites” and “globalism”. Their slogans have been taken over by the far right in Europe and Trumpism in the USA. The dilemma they face with workers taken in by Trumpism is usefully described by the article from Charles A. Their solution is likely to be alone the lines Charles A recommends – more “militant” posturing by denouncing Trump for not actually carrying out the policies he is preparing the way for. I haven’t been following European politics with Brexit etc. But have been following US media and it seems clear that both GOP and Democrat corporatists in favour of globalism have been swamped by populists against it. Mainstream editorials now advocating “improvements” on how to fight foreigners for American jobs. US is moving from a two party system with both parties supporting globalism (but Democrats posturing against it) to a two party system with both parties supporting protectionism (whiile posturing for “fair trade”). A thousand economists signed statements against the Smoot-Hawley tariffs in the 1930s clearly explaining that the results would be as disasterous as they were. Economists have even less credibility today. A very clear stance against protectionism is needed. This does have to confront the problem that Lenin had to face in allying with the Russian bourgeois against the far more “leftist” Narodnik populists. Overwhemingly opposition to populist protectionism will be unpopular. The various countervailing (its own obsolescence) guises of Western imperialism, after over one hundred (humanly and ecologically) destructive years, have succeeded in moving history backwards … a kind of return of “post industrial”-end-of -history modern capitalism to its primitively accumulating roots in merchant adventurer “war capitalism”–first against the natives, then against each other. @ Wal Buchenberg: Millions of young women are pulled out of Chinese villages to sweat in Foxconn factories where they assemble phones and such for export. This has gone on since the early 1990s, well before Donald Trump. Better those workers should make things for themselves – as a class – and develop craft, scientific, and other skills instead of losing their young adulthood in mind-numbing toil and imprisoned in Foxconn dormitories. I know what’s going on in China, I lived there for a number of years. But unlike you, I do not have the arrogance to make recipes and suggestions for half the world’s population – from US to China.